Chauncy Welliver: "I know that I have to make a statement, and that’s how I’m going to do it—by knocking this guy cold"
Exclusive Interview by Geoffrey Ciani – Earlier this evening I was afforded the opportunity to have a nice chat with heavyweight contender Chauncy Welliver (53-6-5, 20 KOs), who will be squaring off against Kyotaro Fujimoto (4-0, 3 KOs) on September 19 in Tokyo, Japan. Fujimoto is new to professional boxing, but is making the transition from K-1 where he was a former heavyweight world champion. Welliver spoke about his upcoming match-up, and also discussed his majority decision loss his last time out against Sherman Williams, which was the first time Welliver had lost a bout in nearly three years ending his 18 fight winning streak. Here is a complete transcript from that interview. GEOFFREY CIANI: Hello everyone. This is Geoffrey Ciani from East Side Boxing and I am joined here today by heavyweight contender Chauncy Welliver. How’s everything going today, Chauncy? CHAUNCY WELLIVER: Everything is going good. I’m still in the hunt. I’m still on my way to a world title and getting ready to fight in Tokyo, Japan. CIANI: Speaking of Tokyo, Japan, Chauncy, you’re going over there. You’re fighting a guy named Kyotaro Fujimoto. He is 4-0 with 3 knockouts. How have your preparations been going for this fight, and what are you expecting going into this one? WELLIVER: Preparations are good so far. You know we have another month. The beauty is, the guy is only 4-0 with boxing. 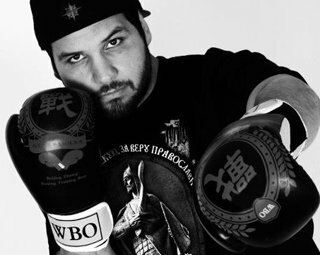 The bad news is the guy is one of the best K-1 kick boxers ever. The good thing is I’m going to be able to cut his arsenal in half. You know the guy is not able to use his legs, but he’s shown so far so good when it comes to boxing. He’s got excellent offense. He’s got very good defense. I think he can do something. I think I’m catching him at the right time. I think he’s a little too young to be fighting guys like me right now. CIANI: Now Chauncy, as you mentioned, you’re going over to Tokyo, Japan, and traveling around the world—it’s nothing new for you. You’ve had fights where, New Zealand has become a second home to you, you’ve had a series of fights in China, and now you’re heading over to Japan. What’s it like for you getting these opportunities to travel all over the world like this in order to have your fights? WELLIVER: You know I love it! If not for the sport of boxing, you know I would not have been able to go to any of these places. I mean I’m already on my second passport. I’ve had so many stamps in those things. I’ve seen so many different countries. It’s been great! Once again, the sport of boxing has treated me well. I’ve gotten to see some amazing things. Thank you, boxing! CIANI: Now Chauncy, you’re of course coming off of your fight against Sherman Williams. You lost a majority decision in a close fight. It was the first loss you’ve suffered in several years. Mentally, how do you prepare yourself to rebound from this and get yourself back into the mix? WELLIVER: You know at first I couldn’t. I was really beating myself up mentally, and thought, ‘How do I lose to a guy like Sherman William?’ But then I started thinking, ‘You know, I was in shape and everything. But my body wasn’t there! My body didn’t respond the way that it was supposed to’. I wasn’t 100%. So that wasn’t 100% me. No excuses from Sherman Williams. I wasn’t able to perform the way I wanted to. Maybe it was the things he was doing. I don’t know, but once again, the beauty of this mentally is I know I have to win this, and I have to win it in a pretty good fashion because I know the officials over there are not easy on Americans. CIANI: So do you feel it’s imperative for you to go over there and make a real big statement in this fight with Fujimoto? WELLIVER: It is. You know one, for the boxing fans I mean of Japan that is—the world wide boxing fans, you know the listeners, the people reading this—they’re going to be saying, “Oh! Well the guy’s only 4-0”. But he’s a pretty big deal in Japan. Here’s one thing I can say. You know I won’t go into any exact numbers officially, but I’m getting paid five times the most I’ve ever been paid, and I’ve been paid pretty darn good! So this guy’s got some apparently great pulling power for them to be paying those kinds of numbers. So getting a win there definitely brings me back. I got to do it impressively and hey! You never know. Maybe I start a new career in Japan. CIANI: Now you mentioned here that this is the most lucrative fight you’ve had in your career to date? Do you think, Chauncy, in a sense that your loss to Williams could have perhaps been a blessing in disguise where, maybe it will open more doors for you? Do you think that in some sense this can help you get better opportunities coming out of that? WELLIVER: Absolutely! Would these guys have fought me two months ago? No. No they wouldn’t have. But now they see a little vulnerability. Maybe they think I’m mentally gone, or maybe they think I’m physically starting to get past it, too, from having so many fights at heavyweight and so many rounds. I mean it’s definitely helped, because as I said I wouldn’t have gotten this call before. Hopefully after this when I get the win, hopefully I get more calls. Once I start getting that win streak going again, the phone will start ringing, so I need to take these fights while they’re there. CIANI: You mentioned all your fights and all the rounds you’ve fought. You’ve been one of the more active fighters in recent memory in the heavyweight division. Now is that your key for getting back on top, or in other words—if you gave yourself a twelve month blueprint, how would you ideally like the next year to play out in terms of your activity? WELLIVER: I would say honestly I think we should cut in half, from fighting six times to three times a year and fighting much, much better opposition—guys in the top ten. I think we need to fight guys like that, especially now because I have to rebound. If I want back in the top ten, you know it took me two and a half years to build where I was in the world rankings. So to get back there, I don’t want to have to do it for another two and a half years. I’m going to have to beat pretty solid guys, and going back to the last question, I think these guys are going to fight me now so it’s going to be a lot easier to get back into the top ten? CIANI: What do you think is the most important thing that you learned from your last fight, having suffered a defeat for the first time, again, in a number of years? WELLIVER: You know it’s really hard to say, because in my mind I wasn’t doing anything wrong. My mind was telling me, “Chauncy, throw the jab” or “Chauncy, move your head”, and my body just wasn’t doing it on that particular night. Maybe it was the jet lag, maybe it was the lack of nutritious food. But he would have had the same thing, except for the nutrition part. So no excuses! It’s really hard to say. Like I said, mentally I see everything. I see everything I should have done, I know exactly what I should have done to win the fight, but my body just wasn’t doing it. CIANI: Now the decision was a close one, as we said, a majority decision. One judge had it a draw. The other two had it by a single round in favor of Williams. Before the scorecards were being read that night, did you think he got the decision or was it kind of up in the air in your mind? WELLIVER: It was up in the air simply because Joe Hipp was telling me after the fight, “You had to do more” and he wasn’t saying if I won the fight. So just kind of from the action that was going on in the ring, I could tell that I lost the fight. I haven’t had a chance to sit down and watch it, and that night it definitely didn’t feel like me. But it’s not as if he did a whole lot more than me, but there was never any question. I mean I more or less figured he had won, because I didn’t feel like a winner. That’s for sure. CIANI: Now back to your upcoming fight against Fujimoto, what do you think is the most important thing you need to do to make an impressive statement like you said you’re seeking out to do? WELLIVER: You know Fujimoto has fought great fighters. I don’t know how closely you follow kick boxing, like Jerome Le Banner and guys like that. This guy’s been kicked in the head. I mean he’s been hit by the best of them and he’s never been knocked down. I think an impressive knockout—I’m not talking about a stoppage, I’m not talking about him being tired and quitting. I’m talking about a knockout! And that’s the one thing we’ve been concentrating on, a lot less movement and a lot more sitting down. You know sitting down with this guy and making him fight me. That’s one thing I think is a possibility. Me sitting down punching, it’s rare that I get a chance to do that, or rare that I tell myself to do that. But if I sit down and do that, and if I knock this guy out I think a statement is made. The power is there, mentally I’m there, and mentally I’ll be so much better because I’ll have a new country under my belt. CIANI: I know you don’t want to get too far ahead of yourself here, but let’s say you go out there and you do what you want to do—you score an impressive stoppage victory against Fujimoto. What would you ideally like to do from there? Would a rematch with Williams be in the cards? Or would you be looking for something above that, a bigger name than that? WELLIVER: You know I would like to fight Sherman just to get that out of the way. I mean preferably a bigger better fight, but I got to get my belts back. I love my hardware. So I would want to get Sherman back, and then after that the sky’s the limit. I would love to fight absolutely anybody after that. Anybody! I mean you can mark my words, and everybody will say, “Hey! He said this a million times”. But really, I will fight anybody after this fight, after I fight Sherman Williams. Once again I’m going to have a whole new country under my belt and a lot more support after this fight. I’m ready for the best of them, no matter who they are. CIANI: We touched on your short term goals before a little bit. You’re 29 years old now. In terms of the big picture, looking at your long term future in professional boxing, having suffered this setback and gathering your thoughts now, what would you ultimately like to accomplish with the rest of your career before all is said and done? WELLIVER: You know my goal has always been to fight for the heavyweight championship. It seems obviously a lot more distant now with the Sherman Williams loss, and as I’ve said rebounding from that is going to be hard. But the goal still is that—it’s to fight for the heavyweight title. Obviously there is Povetkin, there is whoever will win the WBC title. Hey! I’m still eligible to fight for the WBC world title. I’m number 15 in the world. So that would be the goal, and I’m willing to fight whoever to get there. CIANI: Chauncy, do you have an official prediction for your upcoming fight next month against Fujimoto in Tokyo? WELLIVER: Yes. I would love to sit here and tell you a first round knockout, but I don’t see it like that. This guy’s a mover. He’s a great mover at that. I’m going to give him that. He’s going to move, he’s going to run, he’s going to try everything, but eventually I’m going to chop him down and I’m going to start landing those left hooks. For the first time in my life—for the first time in my life—you will never hear this from me on any interview on anything: I think I’m going to knock this guy cold. I think I’ll be the first person to do it. I know that I have to make a statement, and that’s how I’m going to do it—by knocking this guy cold. CIANI: My final question for you: Is there anything else you would like to say to all of the boxing fans out there, all of your supporters, and all of the readers of East Side Boxing? WELLIVER: Of course. You know there are plenty of people who are going to say, “See! I told you! He’s a bum. He lost to Sherman Williams” and hey! I lost to Sherman Williams. But I should have never lost to that guy. I’m going to rebound. It’s easy to say, “Yeah we heard that before”. I’m going to rebound, I’m going to fight Sherman Williams, and then after that we’ll fight whoever wants to fight. The phone is ringing now. I like that! The phone is ringing and they’re offering good amounts of money. I’m ready to take on these fighters, and I know that I will get a heavyweight title shot. I’m saying that to my haters and I’m saying that to the people that have loyally followed me. Thank you for following me, good and bad. I’m going to get my shot! CIANI: Chauncy, one other thing that I’d like to get out there. I know that you had some good news recently. You’ve recently gotten engaged and I just wanted to congratulate you, and I was wondering if you had anything to say on that? WELLIVER: You know I’m with the love of my life. I’m so happy to be engaged! It’s something I’ve been wanting to do for awhile now. This is also something that helps push my career, because now I want to succeed for her. I want her to have a successful husband, you know not a guy that lost his last time when he had a fight. So you know she’s always been very supportive of my career. She’s a beautiful great girl. She’s a huge fan of boxing! Unfortunately I’m only her second favorite fighter behind Manny Pacquiao, but I love her all the same. CIANI: Great. Chauncy, thank you very much for your time, it was an absolute pleasure to speak to you as always. I wish you the best of luck on your fight coming up September 19, and I of course wish you luck following that and going into the future here! WELLIVER: You the man, brother. Thanks Geoff!